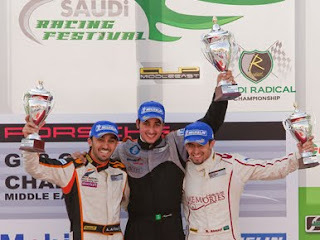 ClassicArabia.com - Our Blog: ClassicArabia.com Racing Driver Makes History! ClassicArabia.com Racing Driver Makes History! Round 1o of the Porsche Cup Challenge took place in Riyadh's Reem Circuit last week. The weather was hot, the atmosphere intense and the concentration levels off the roof. The qualifying session lap times were very close, as this circuit is considered home ground to many of the drivers competing in this challenge, making it all the more exciting. An impressive lap saw Prince Abdulaziz take pole position with ClassicArabia.com Racing driver Fahad coming in second. The race started off with an aggressive roar of the cars' engines, going down the straight and into the first turn. Prince Abdulaziz did not have a perfect start and Fahad took advantage passing him right away. Considered an important race to Prince Abdulaziz to secure the title and win in between a home crowd, he was pushing very hard. But a consistent performance with no mistakes and skillful defensive driving saw the youngest ever driver in the history of the Porsche one-make racing series make history taking his first pole position of the season. Thrilled with the win, Fahad Algosaibi said: "It's the best feeling ever and my best win by far. I was a bit lucky to begin with because Prince Abdulaziz didn't have such a good start and it was very tough to hold on because he put me under so much pressure." "It's not bad to lose a race to someone like fahad. He's very talented and we'll have to watch out for him next year." said Prince Abdulaziz at the finish. ClassicArabia.com is delighted to be behind the ClassicArabia Racing ream in this event. We are an active promoter of the motor sport events in the region. This includes the regional SpeedTrip events, the Bahrain H.O.G Rally and last but not least the E-Rain Formula BMW team.